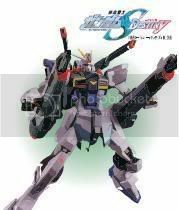 The ZGMF-X56S/γ Blast Impulse Gundam is ZAFT's heavily-armed version of the Earth Alliance's GAT-X105+AQM/E-X03 Launcher Strike Gundam. The Blast Silhouette pack is stored on the Minerva's dedicated hangar for the Impulse Gundam and is sent out onto the field via a computer-controlled flyer craft. The flyer delivers the pack to the Impulse Gundam and automatically returns to the Minerva. The Blast Silhouette pack's armaments include two "Kerberos" long range beam cannons, as well as two "Deluge" rail cannons. Other armaments include a quadruple missile launcher and two beam javelins.